Example scattering pattern (for AgBH). The rings of scattering at well-defined angles arise from scattering off of the lamellar order in the sample. Scattering broadly refers to experimental techniques that use the interaction between radiation and matter to elucidate structure. 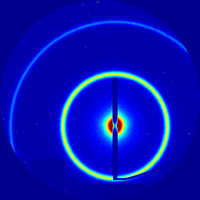 In x-ray scattering, a collimated x-ray beam is directed at a sample of interest. The incident x-rays scatter off of all the atoms/particles in the sample. Because of the wavelike nature of x-rays (which are simply high-energy photons; i.e. electromagnetic rays), the scattered waves interfere with one another, leading to constructive interference at some angles, but destructive interference at other angles. The end result is a pattern of scattered radiation (as a function of angle with respect to the direct beam) that encodes the microscopic, nanoscopic, and molecular-scale structure of the sample. Where is the scattering angle. This is mathematically identical to the (three-dimensional) Fourier transform. This page was last modified on 23 January 2018, at 10:29. This page has been accessed 26,929 times.